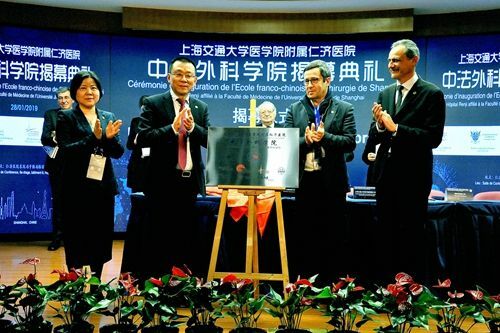 A Sino-French surgeon institute was officially unveiled in the Renji Hospital of Shanghai Jiaotong University School of Medicine, Pudong New Area, on Jan 28. Catering to the whole country and the French speaking countries and regions in Southeast Asia, Africa and Europe, the joint venture aims to cultivate surgical professionals with international vision and R&D expertise by drawing lessons from the training standards of medical experts in France while giving full play to the training bases and clinical training centers of Renji Hospital. Qualified medical students will be enrolled into the institute for surgical specialist training after being accredited by the professional committees. Likewise, medical experts from France can also be engaged with teaching and training in Shanghai. Short-term training in surgical techniques will also be available so as to build the institute into an international platform for training, technical research and innovation exchanges. Though China has competitive advantages in clinical treatment, it is deficient in scientific research and methods, said Gilbert Vicente, secretary general of the institute. Guy Vincendon, honorary president of the institute noted that the medical exchanges between China and France go back decades. 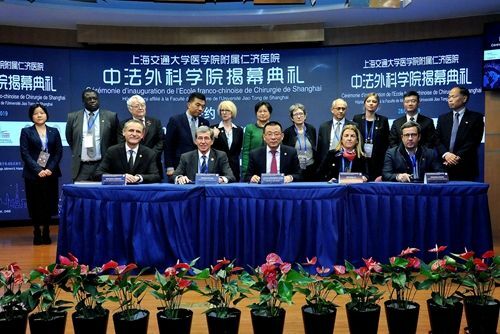 It is hoped that the institute can be developed into a platform to combine French knowhow and experience with China's expertise in medicine and talent training. According to Renji Hospital, the first batch of students will be enrolled this September, who will not only come from local medical institutions in Shanghai, but also globally.